This is a very straight forward assembly, allow one to two hours (depending on your skills and abilities) for the actual assembly, and maybe another hour or so to locate all the parts (this is an excellent Saturday afternoon project for two -- all that "shopping" at different stores . . . actually a good hardware store should have it all -- (if they have a Garden Department for the saucer). 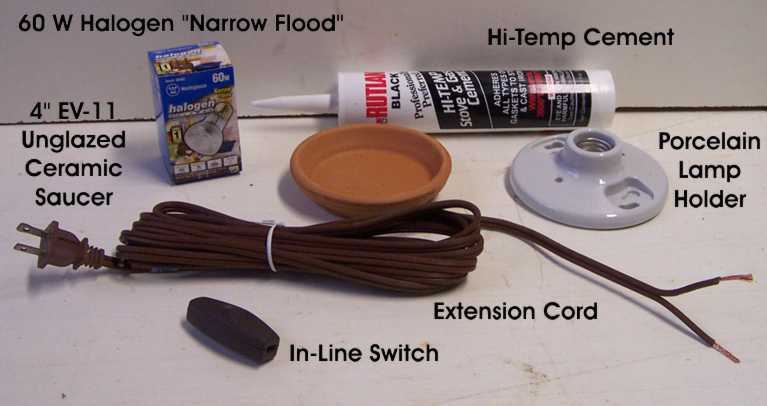 First the parts, one Leviton Lamp Holder (UPC 78477-81902) $2-4, one Lamp Cord $3-4 (or get a cord at a second hand store and strip the ends yourself), one In-Line Switch $1-2, one 4" EV-11 Unglazed Ceramic Saucer $2-3, some kind of cement which will bond unglazed terra cotta to unglazed porcelain, and a Westinghouse Narrow Flood 60 watt Halogen bulb (UPC 30721-05402) $9-12. Twenty bucks will pretty much take care of all the components. Tools, you will need a flat blade screwdriver, a small sharp knife, and wire strippers (or the skill to know how to strip wire with a pair of standard pliers). It may take just a bit of "maneuvering" to slide the electric candle onto the larger saucer -- if it just won't go, remove the larger saucer, but I didn't have a problem when I tilted the larger saucer a wee bit to let the assembly slide into place. Center the Lamp under the steel inner core, just like it was a candle flame. Now you can plug your GlowWarmtm Electric Candle! into a nearby outlet and turn it on (and off) with the spiffy in-line switch. Takes 20-30 minutes to heat up. Remember to turn it off when you go to work! ADDITIONAL NOTES. Most any 4" ceramic saucer will "work" -- if you are not sure, first buy the Porcelain Base, then you can use the Base to "size" it to the saucer. What you are looking for is an unglazed terra cotta saucer that has the same circumference as the Base so that when you bond them together they "fit". (The underside of the Porcelain Base is also unglazed, so you are bonding two similar porous materials -- there are many kinds of "adhesives" that will do this -- pick one that is environmentally sound and that you will have other uses for around the house.) We do not recommend buying the Porcelain Base with either the socket attachment of the pull switch. We do not recommend using the GlowWarmtm Electric Candle! as an extension cord, and if you get the base with the pull switch you will lose your center adjustment every time you turn it on and off by pulling on the switch which will pull on the base which will misalign the lamp. The "big" initial expense is the Lamp -- at this time, we have only been able to find the Westinghouse Lamp in a Narrow Flood and a small size. I am sure that there are other 60 watt Halogen lamps that will work, but try to get a "spot" or narrow flood. The idea is to direct as much of the heat energy upward into the steel inner core. And yes, a standard incandescent bulb will work, the first bulb we tried was a 40 watt standard base candelabra type bulb, it worked, but the temps weren't anything to write home about, so we upgraded to the Halogen and to 60 watts and are very pleased. DO NOT EXCEED 60 WATTS! 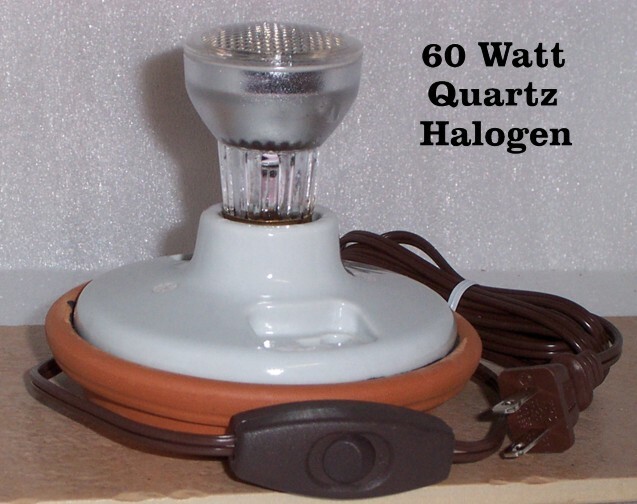 You will create a definite burn issue and possible fire hazard if you exceed 60 watts. You should certainly download the photo above, print it (black and white should work just fine), and take it to the hardware store with you as a buying aide. It will be most helpful to the friendly hardware guy from whom you will be seeking assistance and advice . . . and save a lot of hand waving and explaining. NEWEST NOTES! The current version of the GlowWarmtm Electric Candle! 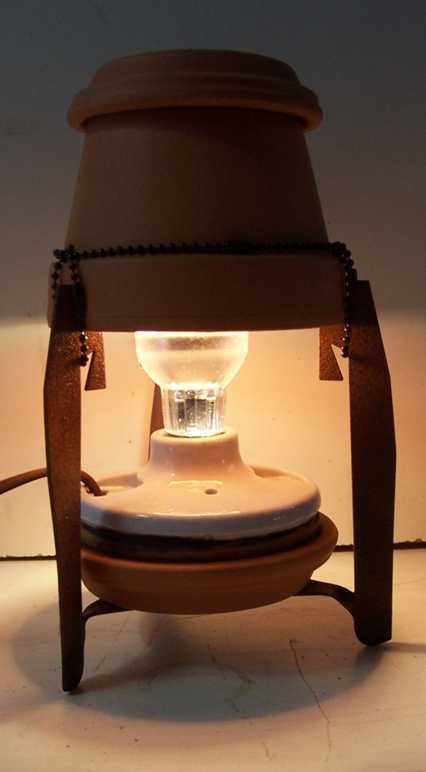 uses a 5" ceramic saucer (see photo above), this gives the assembled unit a bit lower profile and allows for a 4" saucer to be inverted and placed under the lamp assembly thereby raising the lamp further into the radiator assembly. There are minor variations in the ceramics, so make sure that the lamp does not actually touch any part of the radiator assembly when you raise it up. Be sure to have the lamp switched off when you do this. Additional note of interest, I measured the surface temperature of the quartz halogen lamp last week, it was an amazing and temperature probe scorching 729 degrees Fahrenheit! That is about 100 degrees warmer than a typical candle flame. Now I understand why the quartz halogen works so well! If the bright light or the quartz halogen is really bothersome you can try this, a 50 watt Infrared Basking Lamp used to keep chameleons and iguanas warm at night. You can find them at a good pet store. A dollar or so less than the quartz halogen, but still pricey. What is nice is the quality of the light, it is a soft red glow, very easy on the eyes, makes an excellent bedroom night light. We will post additional information as we discover and try out other types and kinds of lamps -- your input and suggestions are appreciated. Don't forget to check out our Spring and Summer Products, the Veg-A-Lottm Growhouse, a 40 square foot insulated greenhouse designed for raised bed Bio-Intensive backyard (or front yard) gardening. This is a fully enclosed year-round growing environment excellent for salad greens, root crops, herbs, hot peppers, and yes, even a tomato or two. More about that here. And we are also proto-typing the Honey Beetm Passive Solar Hot Water Heater. It is a unique serpentine array holding over 20 gallons of H20. More about that here. We believe that our Earth is in serious Environmental/Energy travail and have decided to make the designs, details, and methodology of our energy and environment solutions available to all people on the Earth. We hope our "Global Open Architecture for Environmental Sustainability" (GOAES) will become a model for other globally minded innovators and businesses. The Honey Beetm Solar Hot Water Heater will be designed and presented in an open architecture manner similar to our introduction of the GlowWarmtm Electric Candle. It will take a while for us to get all the details of our other products posted, most of the design of the Kandle Heetertm Candle Holder can be found here, and we will expand this section later. We will retain all rights to our trade marks. We believe that our low-tech common materials approach to environmental and energy problems presents opportunities for cottage based manufacturers all around the globe and we want to help anyone who wants to share these design solutions as manufactured product in their region of influence.